Britain in 2073 looks much different than it does today. Climate change and its effects, including massive earthquakes and storms, have devastated the land and returned large areas of the country to subsistence agriculture, surviving without contacts in the larger world and relying solely on themselves. Evie is a herbalist, using plants to treat illnesses among the members of her village. Her grandson, Jonah, has taken leadership of the community through his charismatic preaching and fearmongering. Among the ancient fears he warns against: witchcraft. Now, Evie must flee in fear of her life, pursued by her own grandson and his adherents to an older version of Christianity, one where witches can only prove themselves by floating on the ocean. Remember Tomorrow starts with Evie’s present situation, her deteriorating position within the community and flight from Jonah. It then shifts to look at her past, her activism as a teenager, her pregnancy and flight away from the city, and her life in the village before Jonah’s frightening transformation into a cult leader. 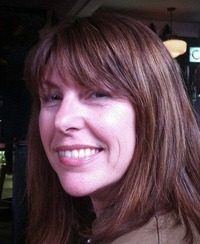 Author Amanda Saint paints a bleak picture of Britain in this time, showing a country enthralled by materialism and blind to its effects on the environment, on social inequality, and on their own character as a people. Climate fiction is a subgenre of SFF that has been generating more and more titles in recent years. Margaret Atwood may be the most prominent among the authors writing in this genre (we reviewed her MaddAddam trilogy last year), but there are a multitude of titles coming out which warn of the devastating effects climate change may have on our way of life and on the planet itself. I liked Remembering Tomorrow. Evie is an interesting and sympathetic main character who is not without her faults. She can be naive and get herself into unfortunate situations. She sometimes neglects her family when she becomes fixated upon a cause. But she has a good heart and strives to do the right thing, both for the planet and for her family. Evie is not the greatest mother, but probably does not deserve the anger her daughter gives her and certainly does not deserve the persecution from her grandson. Britain is almost unrecognizable in this book. Electricity, transportation, machinery, computers, and almost every other modern convenience are gone. People live off what they grow and gather and hunt. Small villages govern themselves, sometimes wisely and prudently, and sometimes by fanaticism and demagoguery. News from the outside world is unobtainable. This is possibly an extreme view of the devastation possible from climate change, but hardly unique. The timeline is quite abrupt, being set roughly 54 years in the future, but saying this is unrealistic is more a statement of hope than of certainty. My only critique is that sometimes in climate fiction the story falls victim to the message. I fear that happens in some of the chapters in this book. It is a good book and a good story, but there are a few chapters that are somewhat strident in their tone. I understand the temptation–I myself am terrified of the future that seems to be unfolding with no one in power willing to take action. But it can be a challenge to “show” the effects in the story when it is easier to “tell” the effects through speaking or dialog. This is not the worst thing that a story could do, though, and Evie is a compelling enough character that these minor flaws do not prevent her story from unfolding. 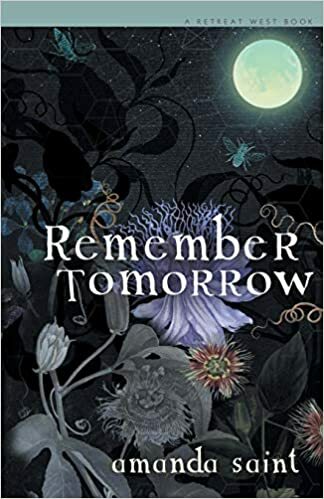 Remembering Tomorrow is a good book from a passionate author. Amanda Saint is a good storyteller, and Evie is a character with a good story to tell. I am glad I had the chance to read it. 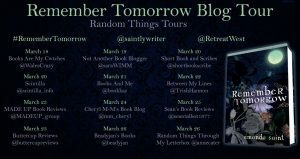 I want to thank both Amanda Saint, the author and Anne Cater, Blogger and Tour coordinator, for inviting us to participate in a “blog tour” for the launch of Remembering Tomorrow on March 21, 2019. I had the pleasure of receiving an ARC in exchange for an honest review, and I appreciate the opportunity. Use the poster to check out the other stops on this blog tour!